This post was originally written on the optimism afforded us by the Golden Globes, before the black-and-white, mostly silent film that boasted a lagging middle and a cute dog as its bright spot won the Oscar for Best Picture. No matter. 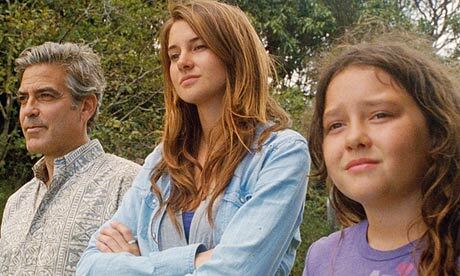 The Descendants will remain the "best" film of 2011 for me, just as Good Night and Good Luck holds the honor from 2005 and The Social Network for 2010. So here is my ode to my favorite film of the year. And there's nothing Uggie can do about it. Films aren't appreciated in vacuums; your life affects your tastes. There is little doubt that my adoration of The Darjeeling Limited came through my love of my two roommates in college, as an only child couldn't exactly piece together the depth of feeling carried out through those curt and punching lines of dialogue between three brothers. No, I had to actually gain some male siblings, live with guys day in and day out, see their emotions ebb and flow based on outside forces and those conjured up in our apartment-as-crockpot on Commonwealth Ave.